EXCLUSIVE TO HIBBA TOYS !! The largest abacus you will have ever seen. Will the kids love playing with this extra giant abacus? You bet!! and for the adults, if the electronic calculator breaks down all is not lost. The giant abacus is ideal for group or individual play. 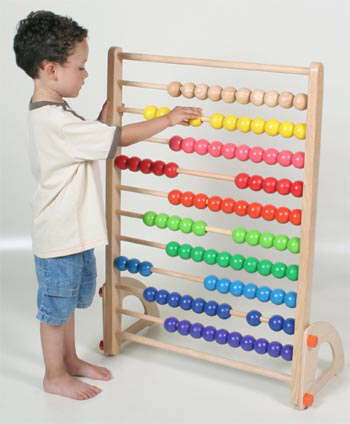 Let your kids count on this 10 row abacus, each row offering a new colour. This giant wooden abacus is an ideal traditional and educational toy. Dimensions: 50mm deep x 920mm high x 560mm wide. Now that is GIANT ! !